Esther Nieves, AM '87, has had many opportunities during her career as a public official, an executive of a social service organization, and as a foundation leader to reflect on how SSA helped her understand systems in society. Her work at SSA helped shape her understanding of how the systems of government and institutions work together in efforts to help people improve their situations. “I did my field placements at Hull House, working on efforts to celebrate the trailblazing work of Jane Addams and the development of public policy actions focused on jobs and economic development.” Another part of this work was Hull House’s efforts to ensure an equitable census count to make sure that the Latino population—and other communities—were not under counted in the 1990 U.S. Census. Nieves had been working for the city as part of Chicago Mayor Harold Washington’s Commission on Latino Affairs and became executive director after graduating from SSA. “I worked with other municipal agencies, and testified before the city council to promote economic development, education and health for the city’s burgeoning Latino population,” says Nieves, who received her BA in Latin American Literature and Education from Loyola University Chicago in 1985. After her time with the city, she joined the Field Foundation of Illinois in 1990 as a program officer overseeing grants on community development. She then became executive director of Erie House, a Chicago-based social service agency. “Erie House is one of the city’s oldest settlement houses, and while there I was engaged in strategic planning, some program expansion, and actions promoting balanced development of the quickly gentrifying neighborhood. In partnership with Erie’s board of directors, I helped shape the mission statement to reflect the value of justice and inclusion,” she says. Her work at Erie House gained her recognition from the UChicago Alumni Association, which awarded her a Public Service Citation in 2003. While at Erie House, Nieves got involved with the W.K. Kellogg Foundation. 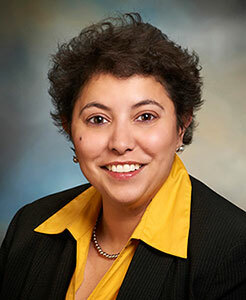 In 1997, Nieves was one of 38 individuals nationwide selected for the Kellogg Foundation’s National Leadership Program. “As part of the fellowship, I learned more about leadership as another tool for social equity. As Kellogg Foundation fellows we also had projects and I chose to study women in peace building efforts. What role do women play in this process? What can I learn and bring back to my community,” she asks. As part of that project, she traveled to South Africa, Poland, and Northern Ireland to learn more about how women promote piece in troubled areas. “I talked with women in Northern Ireland, for instance, who were in the Protestant community and the Catholic community.” The women shared their pain in having their sons or family members killed in violence and used that experience to help build empathy and mutual healing across these two communities. She then entered New York University in 2003 to complete a master’s degree from the Wagner Graduate School of Public Service in 2006, and then joined the American Friends Service Committee to direct its national project focusing on immigrant and refugee rights. “We worked on public policy issues, alliance-building, and supporting civic participation,” she says. In 2010, she returned to the Kellogg Foundation as a program officer in its community and civic engagement unit, which provided support for programs that engaged community members and vulnerable populations. Her role at Kellogg now brings her back to the program that brought her in touch with the foundation in the first place.